By far the most popular electric flame fire on the market, Dimplex’s Cheriton (CHT20) electric fire just got better, offering timeless English styling with new and improved features that comply with 21st century eco expectations. An affordable, zero maintenance fire that brings a cosy glow and supplementary heat when you need it most. Cheriton is a freestanding fire with Optiflame®, the world’s most popular electric flame effect and real coals which can be used independent of the 2kW fan heater. In keeping with the latest Europe-wide Eco Design legislation for electric heating products, Cheriton now boasts enhanced features, including an accurate thermostat to reduce energy wastage. Controlling the Cheriton has also been greatly improved with the inclusion of a new remote control handset that lets you switch the fire on or off from the comfort of your sofa. The Optiflame effect is also improved with low energy consumption LED lighting than far outlasts older bulb systems, meaning maintenance becomes unnecessary. With traditionally styled black and brass effect finish, it is designed to fit ‘flat to the wall’ covering rough, craggy open fireplaces or filling a blank wall space. 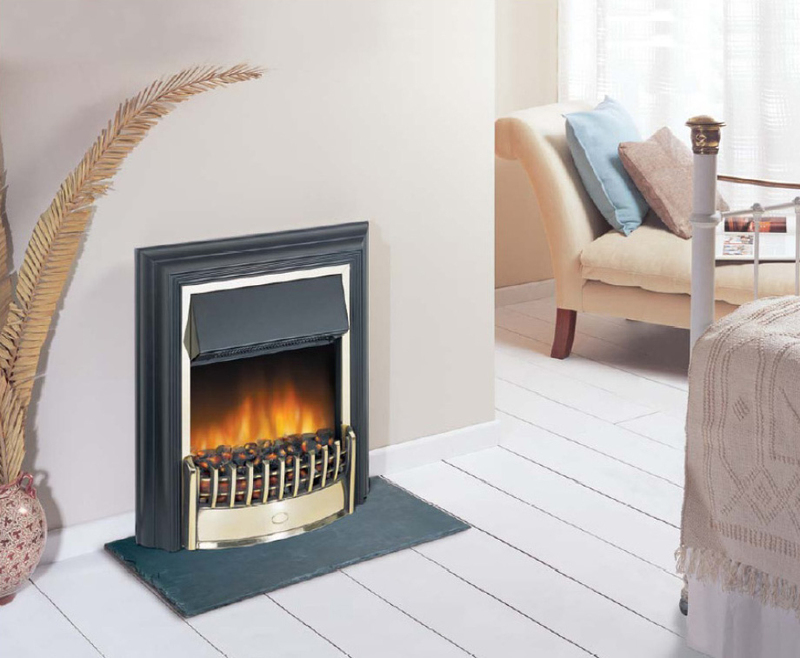 Add a reduction in weight and Cheriton is now even easier to install or reposition around the house as needed, giving you the versatility to place a fire where you want it.